Whatever may be your opinion of Moldovan foot fashion, the Bible says that the feet of those who bring good news are beautiful.
" How beautiful on the mountains are the feet of those who bring good news..."
This week the feet of my friend Vlad have taken on a whole new beauty. After a farewell last Friday from the OM team, and a commissioning service at his church on Sunday, scads of us went to the airport on Wednesday to see him off. My sympathy was totally with his mom, saying goodbye to her son for 2 years, knowing that he is going to preach the gospel and serve the Lord in a country that is anything but hospitable towards Christians. But at the same time I was really excited and of course his departure brought back all kinds of memories of what it was like for me to leave my home to go to a far and distant land where I didn't know the language or the customs or the culture or anything about the people. Now 1 1/2 years later I am still surviving and excited that I have had a small part to play in preparing Vlad for his ministry in an east Asian country. 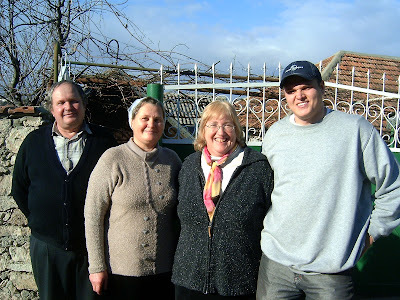 Here is a photo of me with Vlad and his parents. God bless them all! Please pray for Vlad as he learns a new language and adusts to his new surroundings. I did get an e-mail from him today letting me know that he arrived safely. I am glad. Thanks be to God. Posted by Barb at 7:27 p.m.
A pinch of unreality - or is this possible?